The judgment of the quality of the fish of the director Mr.Matsubara who belongs to outside commerce department of Yamaharu gets full trust from the maestro chef and the cook. The technology that judges fish's quality might be one of the technologies of the middle trader, too. 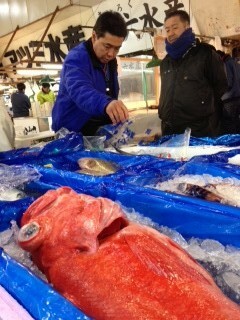 When he took the photograph, a man who knew fish's depth said, "Forge the judgment of fish's quality". It was clearly said, "It will be our work to supply the fish that customers were satisfied most". After all, it is a professional. Eyes that see the fish are serious.